I'm in DC on travel and came down to the hotel lobby to see this. I remarked on Twitter that it looked like the MSNBC hosts had been swallowing toads all night. 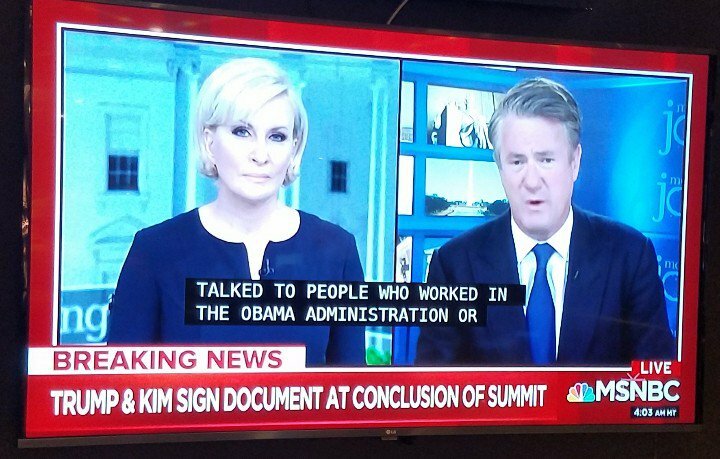 I didn't notice the chyron about "people who worked in the Obama Administration." Good luck trying to get the American people to believe that this historic summit was somehow due to Obama. 1. Bluff and threaten to get the other guy off balance. 2. Abruptly offer them a really pretty sweet deal, basically giving them everything they ask for. 3. Wait for the other guy to go all-in on his side of the deal, and then if he sees an opportunity to take the money and run while leaving them hanging, do so. 4. If they are still talking with him after this, go back to Stage 1 and repeat. He's at Stage 2 with the North Koreans right now. Stage 3 is where I think there is real potential for everything to go bad. Or, for everything to go right and leave him smelling like a rose. Hard to say. For some time now, Trump's actions have reminded me of something that Heinlein wrote in one of his books: "Every situation should be turned upside down occasionally. It lets in air and light." To the extent that anything good comes out of Trump, I think that pretty much sums him up. And what we have been doing with North Korea since the 50s has obviously not been getting anywhere. So maybe turning everything upside down, and letting the debris fall where it may for good or for ill, is the best thing to do at this point. It may still be a problem, but at least it will be a different problem. I'm mildly annoyed that it's taken THIS MANY PRESIDENTS before we got someone who would listen to the experts on Korea. The whole "oh well maybe we won't show up" thing was absolute text book-- and it took this long for someone to go "well, fine, it's canceled" rather than trying to entice him back. Also very amused by the "concession" being that we're not going to do the join exercises...which are over. Building in a "hey, you didn't keep up your end, exercises back on!" option for next year. You're Horrible Just The Way You Are! Is The Racialism Thing Just About Played Out? Didn't We See This Movie Already?